Cody Coffman and Sgt. Ron Helus i'd as Ian Long shooting vicitms. Cody Coffman and Sgt. Ron Helus are identified as Thousand Oaks shooting victims at the hands of former vet, Ian David Long. Authorities yet to find motive. A father has identified his 22-year-old son as among the 12 people killed in the shooting rampage at a southern California bar. Jason Coffman says his son Cody Coffman had been identified among the victims. At the time, Cody was working as a bouncer when former marine vet, Ian David Long entered the Borderline Bar and Grill just on 11.20pm, Wednesday night when he unleashed no less than 30 rounds of gunfire into the packed nightclub which was full of surrounding college campus students. At the time- the venue was holding a weekly country music dance night for college students. Estimates involved up to 200 attendees. After unleashing his venom, the highly decorated veteran who’d served from 2008-13, including 2-3 tours of Afghanistan shot himself dead. Talking to nbcnews, Cody’s father said he’d talked to his son as he was heading out to work, imploring the son not to drink and drive. His son Cody is one of the 11 that was killed. He had just turned 22 and had plans of fulfilling his dream of joining the military. Jason says Cody was excited to meet his sister due later this month. Sgt. 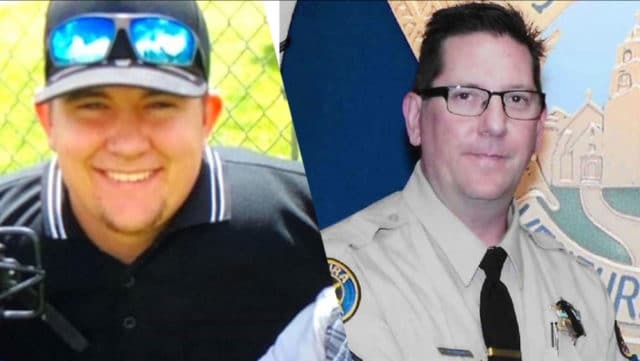 Ron Helus was revealed as the slain deputy with reports of the sheriff’s deputy scheduled to be retiring next year, according to authorities. The revered officer had 29 years of experience in the force and leaves behind a wife and son. The 29-year police veteran leaves behind a wife and son who was looking to retire in the next year. Helus, 54, spoke to his wife by phone just before he went inside the bar, telling her, ‘I gotta go, I love you, call you later,’ according to Dean.